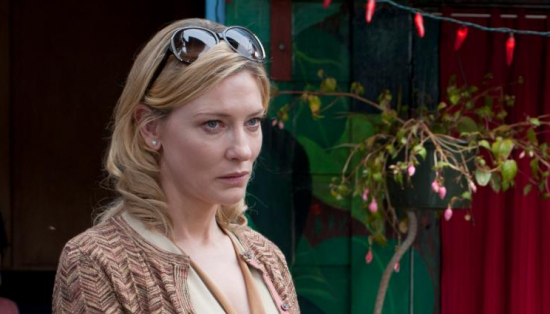 Blue Jasmine is no Purple Rose of Cairo or like any of Woody Allen’s earlier, funnier stuff. It is somber and bitter, almost too much to enjoy. But since Allen is in the director’s chair, comedy relief can be found in the simplest long shot of a cramped apartment with too many personalities. Blue Jasmine is Woody Allen’s answer to the economic crash in the U.S.: the feelings of betrayal it left us with, the overhanging guilt of our compliance, yet still recalling the memory of a sweet life lived not long ago. Jasmine (Cate Blanchett) is stressed and hardly recovered from a recent nervous breakdown. After losing the ritz and glitz of the Bernie Madoff-esque fortune of her husband, Hal (Alec Baldwin), she’s unceremoniously dumped on the doorstep of her sister, Ginger (Sally Hawkins). Now stuck with plebeians, Jasmine makes it her mission to get out and on her feet as soon as possible. Lacking a college degree and any serious experience, she’s got her work cut out for her. In a sense, it’s a meeting of the prince and the pauper, except with both broke in an inexplicably charming San Francisco apartment. There’s a claustrophobic feeling of an inability to escape in many of the situations Jasmine and Ginger find themselves in. For instance, Ginger struggles to find a nice guy, and Jasmine tries to get her to see that she deserves better. But like Jasmine, Ginger seems to have the same deck of cards stacked against her. Despite starring comedians like Louis C.K., Andrew Dice Clay, and Baldwin (who also starred in Allen’s last film, To Rome With Love), there isn’t a flat-out joke in sight. Instead, the comedy is subdued and situational, as when a flustered Jasmine is caught in an elaborate lie or Ginger is stuffily stacking apples while her macho boyfriend pleads with her to come to him. Jasmine’s backstory is told in spurts of flashback moments, creating a bittersweet tone as the wretched reality is juxtaposed against the pleasures of her past. Cate Blanchett gives an extraordinarily impressive performance as the anxious, elitist, selfish, yet tragically sympathetic leading lady. Her character is stranded, wanting desperately to go back to her vacation homes and organizing charity events. She harbors an exorbitant distaste for those she considers on the lower rungs of society, something her sister and assorted flings are quick to rebut with a reminder that her once-affluent husband was the one that bankrupted them all. But the notion that everyone is terrible is part of the reason the film feels almost too dark to enjoy. There’s an undercurrent that a misplaced faith in the rich—as when Ginger and then-husband Augie (Andrew Dice Clay) blindly invest in Hal’s Ponzi scheme—has led them all to financial ruin. The movie is appropriately gloomy as to Jasmine’s prospects of returning to her lofty pedestal. She will always be marred by the ruinous specter of possible compliance. Perhaps Woody Allen wants both America and Jasmine to accept that those salad days may never return. However bitter a pill the movie is to swallow, Allen makes it an aesthetically interesting one to watch. As always, he is in command of the camera and knows how to use it. In his trademark fashion, he readily leaves the camera running as different characters pace around an apartment, letting them come and go to fill the screen space. He leaves its focus fixed on moments too awkward or unpleasant, and doesn’t cut away when reality becomes too harsh. The method is also what allows tiny breaths of comedy to seep in and lighten the mood. However, it looks like the charms of San Francisco are not as touching as the roads of Rome, the canals of Paris, or the streets of Barcelona. Precious little is seen of its setting, apart from a few peeks at the Golden Gate Bridge and Ginger’s (not so) grungy neighborhood. Perhaps the audience is not meant to get swept up in any fantasy or escapism, since its characters are denied any such reprieve. The movie could be set anywhere in the U.S. that hosts a crab shack near the water. And yet, Blue Jasmine fits right alongside Allen’s recent European adventures in terms of quality. The cast is perhaps less star-studded but no less talented and Blue Jasmine deserves to be seen for Blanchett’s performance alone. The movie is a near-perfect capture of a woman on the edge of a nervous breakdown without going off the deep end into a farce. It begs your sympathy for a rather uncaring lead, meaning this jasmine by any other name would not smell as sweet.